Making a flashing LED circuit is a good project for those just learning about electricity and how circuits operate. With the use of LEDs, you are able to see how the circuit is operating. 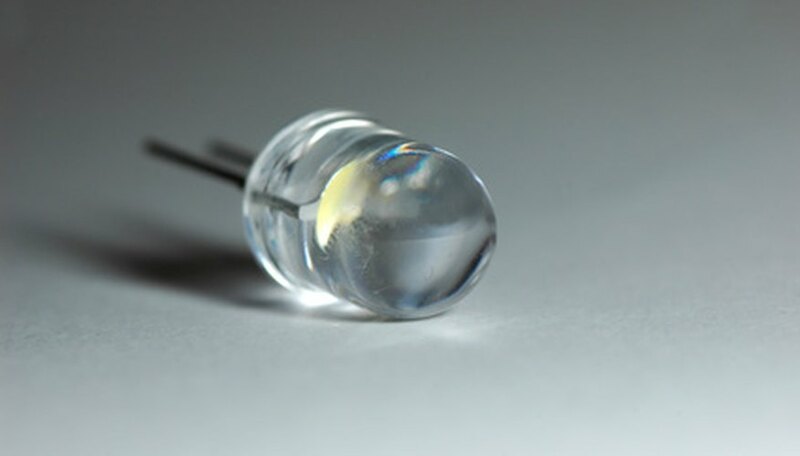 Special LEDs are available that have the capability of flashing automatically, making the wiring of a flashing LED circuit much simpler than it was in the past, when making an LED flash required many other electrical components. Identify the positive and negative leads on the LED. The longer wire is usually the positive lead. Use the LED calculator( see Resources) to select the correct resistor to use with your circuit. Connect one wire of the resistor to the positive lead of your LED. You can connect the wires using caps, by soldering or by wrapping a wires around the LED lead. Locate the positive lead of the battery holder. This is usually a red wire. Attach the positive lead of the battery holder to the other end of the resistor. Connect the negative lead of the battery holder, usually the black wire, to the negative lead of the LED. Insert batteries into the battery holder. If the circuit is connected correctly, your LED will flash. Choosing the wrong resistor for your circuit could result in the LED overheating, or failing to work at all. Lawrence Stephens has been writing professionally since 2008. He has written on a variety of topics for newspapers and websites, including Bizcovering and "The Harbor Sound." He has worked as a ghostwriter in fiction and nonfiction. In addition to writing full time, he is working toward a Bachelor of Science in computer programming from the University of Phoenix.